PVI Multifold Ramp separates into two pieces for easy carrying, 30" wide, 800lb capacity. 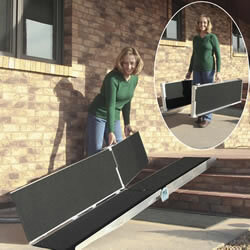 PVI Multifold Ramp separates into two pieces for easy carrying, 30" wide, 800lb capacity. Made In USA. WCR530 5' 30" 32-1⁄4” x 16” x 9” 30 lbs. 800 lbs. WCR630 6' 30" 38-1⁄4” x 16” x 9” 35 lbs. 800 lbs. WCR730 7' 30" 44-1⁄4” x 16” x 9” 39 lbs. 800 lbs. WCR830 8' 30" 50-3⁄4” x 16” x 9-1⁄2” 52 lbs. 800 lbs. WCR1030 10' 30" 62-3⁄4” x 16” x 9-1⁄2” 63 lbs. 600 lbs. WCR1230 12' 30" 74-3⁄4” x 16” x 9-1⁄2” 73 lbs. 600 lbs.